Originally uploaded by Jess Hutch. 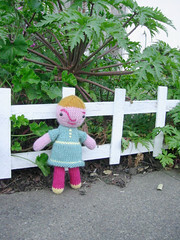 This doll was made using (what else) Lamb's Pride Worsted, on size 8 bamboo dpns. I used my bunny pattern as the basis, because, well, why not? I spent the weekend at Disneyland in Anaheim, California. I'm not a huge fan of Disney or its characters and products (and I used to work at Pixar, so I've got their kind of Disney angst, too), but I love to visit Disneyland. As a kid I was fascinated (obsessed) with dioramas and miniature environments, and I feel like this has to have something to do with my interest in DL... it's like this incredible, artfully detailed environment in a scale smaller than reality but larger than miniature. If any friend of mine were reading this over your shoulder (creepy!) they'd be saying "not THIS rant again." But I stand by it - as intensely distressing as so many aspects of Disneyland are, I am still mesmerized by the place. Visitors to Disneyland are obliged to worship at the Temple of Mary Blair, aka It's a Small World. Say what you will about the annoying song, the cutesy kids, the, um, damn song, it's still the Disney product that is the most Mary Blair of all, and for that reason I love love love it. To the right are two pics I took of the It's a Small World ride. The first is of the outside, which was only recently returned to its original (and superior!) white and gold look. I even love the area where you get on the boats, it's got that early 60s amusement park aesthetic, still! The second shot is of the inside of ride. Lovely! Because I'm not working on any toys today, I thought I'd post a pic of something I made a while back... it's an "oldie but goodie" as the Carpenters would say. Or sing. Anyway, here's the tiki card holder in all its glory. For those, like me, who like knitting non-clothing items, here's an awesome Fiestaware-inspired knitted tea set from Interweave Knits, designed by Annie Modesitt. There's a bunny knit-along happening over yonder... it's so interesting to see how our favorite woodland creature, the rabbit, has been interpreted by other designers and knitters. And here is a lovely gallery of knitted toys. The site is in Swedish, so it's difficult for me to figure out who made these and why. Could Fredriksbergsskolan be a school, perhaps? But go look and love. I think this one's my favorite. Just in time for spring... a goofy little bunny. You can make one too, since I wrote the pattern down! Fancy that. He is knitted on double-pointed needles, which is such a nice way to knit toys. I made him using pink yarn but you could use any color of any worsted-weight yarn. 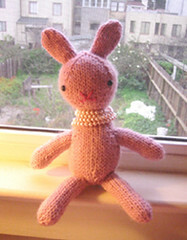 I think a lime green bunny with a hot pink ribbon around its neck would make a great gift. Or lavender and yellow? The choices are LIMITLESS. So I was perusing the website for the Knit 2 Together exhibition happening over in London (do we have something like the Crafts Council here?) and I discovered the fabulous creations of Donna Wilson. I googled her and voila, here is her website and it is a DOOZY. She makes really wonderful creatures and other knitted stuff (along with various other crafts) and you must check her site out now. She makes her creatures by machine knitting and sewing them. Speaking of knitted creatures, I'm trying to figure out how to tackle this month's Month of Softies theme ("portrait of the artist as a young child"). I want to knit this one, I think, since I'm trying to focus on knitted toys and I've been thinking about making a human figure for a while. I have many books on knitting dolls and although they are all helpful I want to go in a kookier direction... hmmmmm. Also, should I do me at 2? At 8? When I was 8 I often wore this really great prissy outfit: dark blue skirt with a pastel woven belt, pink tights and oxfords, and a plaid blouse with a fluffy bow tie. One day a friend of mine said, "every time you wear that outfit you're really BOSSY!" I really meant business in those clothes, man. * Maybe I should depict myself wearing the Professional Third Grader ensemble. *It was the eighties. I'm surprised the blouse didn't have shoulder pads. I'm lucky to live in a city with a great Japantown. I could spend hours in the bookstore there, looking through the craft books (I have to look at every single one, since I can't tell what they're about by looking at the spine). Recently, though, I've noticed that I can't find quite so many of the books I'm looking for... I wonder if the secret's out? So now I'm looking for them on ebay, which sort of seems like cheating. But I need my fix.